Last week’s episode of Below Deck Mediterranean showed us why a crew of young, good looking people who like to hook up with one another makes for great reality TV. We rejoin the Sirocco mid-blow up, with Chief Stew Hannah Ferrier and Deck Hand Bobby Giancola, continue to go toe-to-toe over what essentially boils down to a really bad case of blue balls for the night. That’s right, Viewers, they are drunkenly fighting over whether or not Hannah ruined Bobby’s chances of possibly hooking up with fellow Deck Hand Malia White. Ahhh, this reminds me of the good ole days when I was young and carefree, going out and getting wasted with my friends on the Croatian coastline and then coming back to the yacht and arguing about who I get to hook up with. Oh wait, sorry, no that wasn’t me, because that isn’t a real problem or a real lifestyle that anyone can relate to so can these guys please spare me of all the dramatics? I know, I know, I sound bitter and I guess I am but I would like to move on from something so silly at this point. But alas, if we moved on, there wouldn’t be much for Bobby to throw a fit about and BOY, is he ever throwing a fit. My man Bobby really needs to get laid because he is just not letting this issue go and he’s still grumbling about it the next morning. I was pretty excited to learn Bravo renewed Below Deck Mediterranean after a jam packed season one. Maybe it’s the fighting and staff hook ups, maybe it’s the colorful, international cast, but mostly, it’s the backdrop of the gorgeous Mediterranean that I can’t get enough of. From my couch here in the good ole U-S-of A, a yacht sailing around Croatia is just what I need to remind myself that there is more adventure in the world than making it out of Target without spending a week’s paycheck. Sigh. This season, the crew is sailing the seas on the Sirocco and Chief Steward Hannah Ferrier and Deckhand/Horny Bro Bobby Giancola have returned, much to my delight. Bobby is new and improved after quitting his fire fighter job, losing his spot on the shirtless fire hunks calendar, and getting some clear braces after all those fat tips from last season. What hasn’t improved is his high school level of immaturity when it comes to the ladies. Ahoy! Below Deck Mediterranean is back! And with it comes Bravo’s first ever female captain, Sandy Yawn. Previews suggest that Captain Sandy is just the sort of no-nonsense leader we like to see, bringing plenty of experience and gravitas to the job. She’ll need it to rein in the typical gang of hooligans Bravo rounds up to destroy property and embarrass themselves run Below Deck’s charter season. Maintaining that she’s not “bossy or b*tchy,” Sandy does argue that she keeps her crew in line. “I will like slap them across the head and go, ‘How old are you? You’re 24? Okay, well you’re acting like you’re 12. '” Speaking of 12-year olds, at least Sandy doesn’t have to contend with the likes of Danny Zureikat, as he’s busy “making moments” elsewhere these days. Although, former deckhand Bobby Giancola and chief stew Hannah Ferrier from season one may keep her busy enough! They’re baaack! Below Deck Mediterranean season 2 kicks off May 2nd with an almost brand new cast and our first female captain! The only season 1 crew members coming back for another go are Bobby Giancola and Hannah Ferrier. 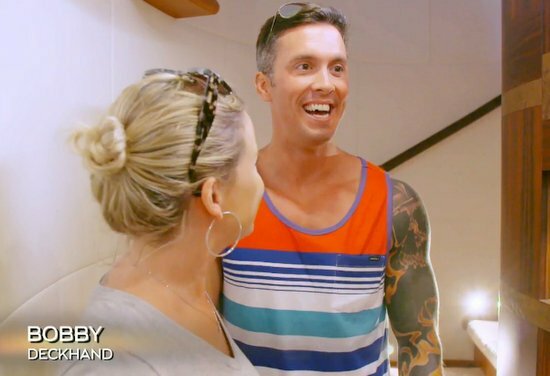 Ben Robinson had announced last month that he would no longer appear on EITHER of the Below Deck shows and we pretty much knew that Danny Zureikat was a no-go! So who do we have this season? Newcomers Malia White, Adam Glick, Captain Sandy Yawn, Wes Walton, Lauren Cohen, Max Hagley, and Bugsy Drake. Keep reading for their profiles. CLICK THE CONTINUE READING BUTTON FOR THE BIOS AND PICS! Everyone who watched the first season of Below Deck Mediterranean knows that the only people who Danny Zureikat got along with were the charter guests – which is super awkward since he spent significant more time with the ship’s staff. Danny’s behavior infuriated the crew and distanced him even more from the group. I can’t tell if Danny was just eagerly going after a tip or if he was building genuine relationships with the charter guests, but weirdly enough Danny has revealed that he is in touch with some of those people.